The Indians called it "Couchiching", lake of "many winds". Often, this is a reference to the many wind directions. 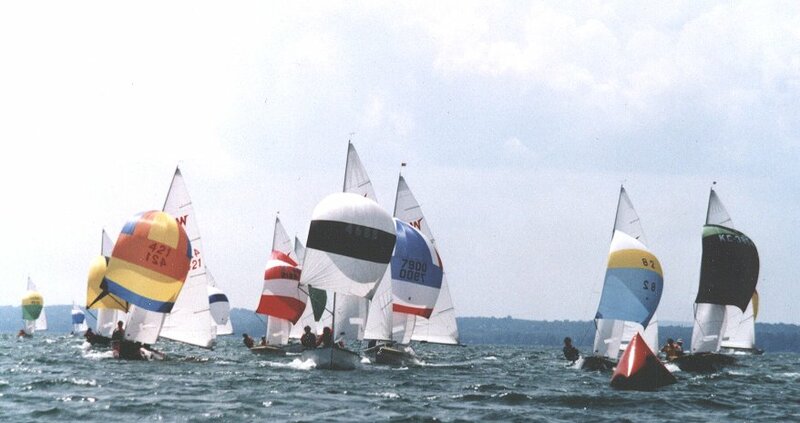 But during Worlds Week, it also meant lots of wind, which was mostly in the 15 to 20+ knots range in this series sailed 90 miles north of Toronto. Again, the Brits feasted on these conditions, sweeping the top 10 places. 13 of the 15 UK crews were sailing their own boats as Canada Maritime Agencies sponsored containerized sea & land transport right to the site and back! 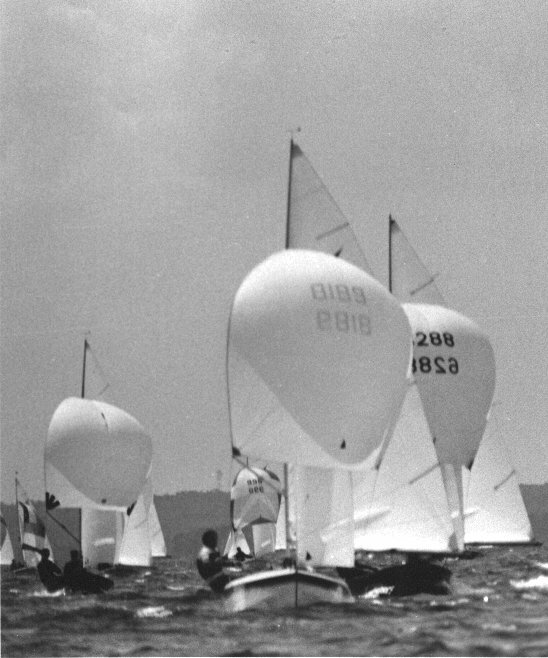 But even the two crews who were sailing borrowed Abbott-built Mk 1’s placed very well: 6th and 8th, with Trevor Newley winning one of the races. in the lovely Lake Couchiching breezes. ..... In the early going, Jon Townsend was a definite threat, with a "bullet" in race 1 and four more good placings. In the final two races however, Jon faded to a 10-11 and barely held 3rd over UK light-air aces, Tony Perkins and James Harden. Winners of the new Bacardi Cup as top Canadians were Brian and Cathy Love of Toronto who placed 11th. Bronte’s Alf Easy with Sandy Clifford provided the other Canadian bright spot with a win in race 6. Joe Schnur and his wife, Janis, of Lake Orion, Michigan led the U.S. Team with a 19th. And there was a sad note: for the first time in Wayfarer Worlds history, no Scandinavians were able to make the trip. 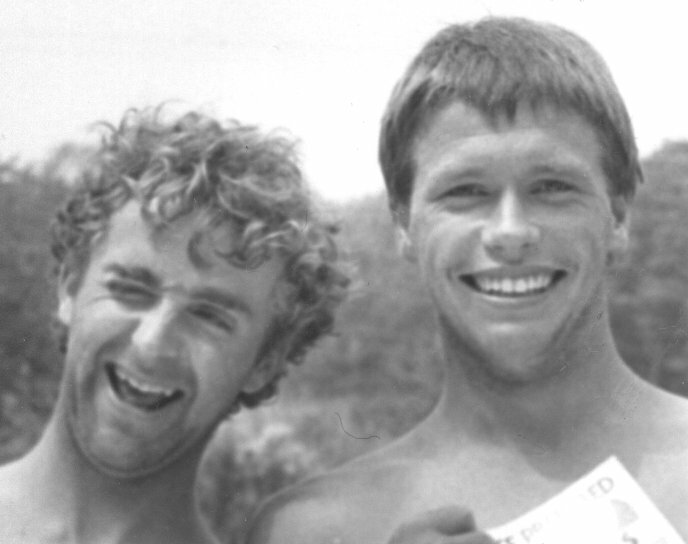 With more and more Wayfarer sailors recognizing the Worlds as a unique opportunity to get to know Wayfarers from other parts of the world, the CWA instituted a "buddy system" which paired each host crew with one of the overseas crews. The hosts assumed responsibility for their guests’ general well-being while they were in Canada. Some of the friendship begun during that week are still going strong 15 years later! 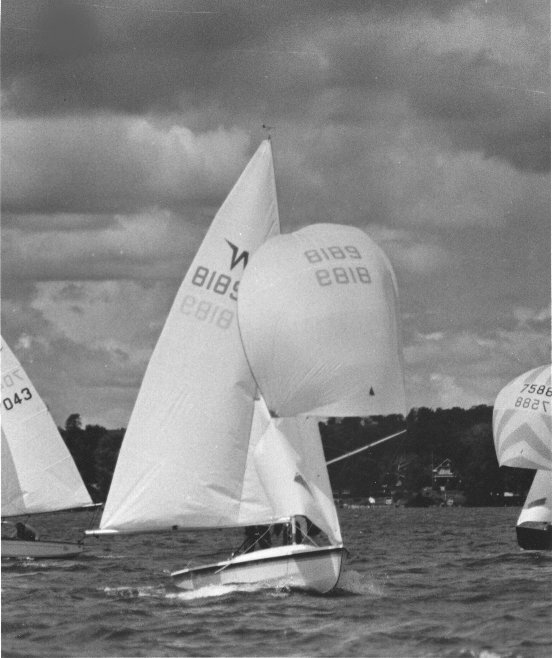 The Bacardi rum Wayfarer Worlds were sailed out of the Ontario Sailing Centre which provided us with a fine, professional Race Committee. Since the Centre is on the grounds of the Geneva Park Convention Centre, we were able to house and feed all the competitors and their guests on site. This proved to be a perfect way to promote a feeling of Wayfarer family that has really benefited the Class. With the winds and the warm, sunny weather co-operating, the Bacardi rum Wayfarer Worlds were well enjoyed by everyone: from the opening Bacardi-sponsored reception, through the games nights, the Cricket game, the water-skiing to the final awards banquet and farewell bash highlighted by the emotion-charged and less than sober singing of "We’re all going up on sunshine mountain". 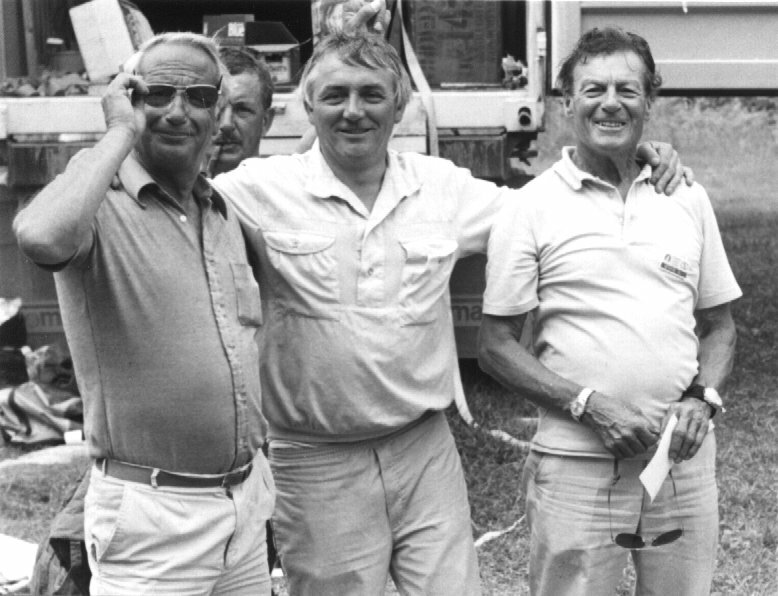 Worlds VI Trivia: Derwyn Hughes once more towed his Wayfarer BIG BIRD 2000+ miles from Calgary to the Worlds site while from the other end of Canada, Keith Davies and Frank Hendriksen came over 1000 mi. from the Province of New Brunswick. And we had Jimmy and Elaine Clouston from the Orkney Islands north of the north end of Scotland! as Colin Wilson (West) looks (lurks?) with his ever-present pipe going full blast. Approaching the gybe mark: left to right: George Blanchard, ?? ?, ?? ?, Mike Codd, ?? ?, Derwyn Hughes, ?? ?, Alf Easy (leading this group), Graeme Hinton, Nick White, Al Schönborn, Geoff Hodshon.